International hat day is an opportunity for everyone to release their inner mad hatter and celebrate the simplistic joys of a hat. Residents at Lymewood Court took part and celebrated this national day with some residents choosing simple and traditional hats, whereas some opted for some sillier options. The day started with staff modelling the variety of hats for the residents and a quick quiz about all of the different types. Although it may at first seem unusual, trying on all of this wonderful headwear triggered many memories and provided a great way for the participants to reminisce. 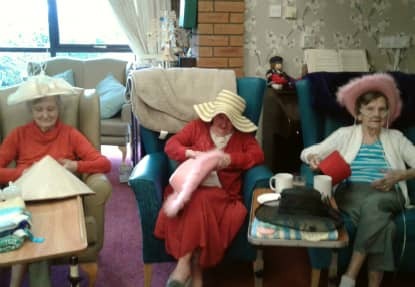 “The ladies reminisced about wearing their best hats as part of their Sunday best” , said Louise Mitchell, Activites Coordinator at Lymewood Court. “The Fez reminded one gentleman of Tommy Cooper and the discussion went on to his famous catchphrases”, Louise added. The day ended in a lot of laughter amongst everyone, as old clips of Tommy Cooper were played on the iPad. What a fantastic way to end International Hat Day! To keep up to date with news from the home, follow us on Facebook and YouTube.